One of America’s best Thai restaurants is a groovy little place called Pok Pok in Portland, Oregon. Opened in an old house by a young chef named Andy Ricker, it’s a shrine to thai grilling—and the best hangout in town. Pok Pok started, more or less, as a cookout. When Andy Ricker opened the restaurant in 2005, it was a Thai takeout shack outside of his house in a residential neighborhood in Portland, Oregon. As Ricker worked a rotisserie grill in his driveway, customers would mingle in the yard and jockey for seats at the picnic table. Pok Pok was too good to stay small. When the lines for Ricker’s garlic-and-lemongrass-scented hens grew too long, he added seating in his living room and turned his basement into a bar and dining room he dubbed Whiskey Soda Lounge. He bought more grilling rigs (he now has seven), leaving them parked outside as if displayed at a yard sale. And he expanded his menu beyond the hens to include equally sensational dishes like baby back ribs glazed with honey and giant shrimp with a cilantro-citrus dipping sauce. There are at least 30 Thai restaurants in Portland, but Pok Pok (the name is the Thai phrase for the sound of a pestle pounding against a mortar) quickly became not only the local favorite but one of America’s best. 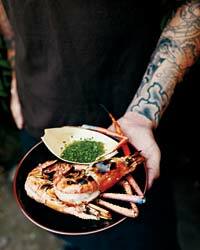 Its success has spawned a second restaurant called Ping (Thai for “grilled”) in Chinatown, where Ricker serves a pan-Asian menu of small plates meant for sharing, izakaya-style, as well as Asian-inspired cocktails. Back in the U.S., Ricker studied Asian cooking techniques while working as a painting contractor. He found himself returning to Thailand over and over, and becoming increasingly mesmerized by the variety of the country’s many regional cuisines. Whenever he flew home from a trip, though, his efforts to re-create true Thai flavors were hamstrung. “For years, I couldn’t replicate a thing, or find it in any restaurant,” he says. The problem is that many authentic Thai ingredients just aren’t available here. Take Thai limes, for example. There is a popular Thai phrase, manao maimee nam, which roughly translates to “lime without juice.” Thais use this idiom to describe something dull or lackluster, but they could almost be describing the unsatisfying limes sold in America. It’s not that these limes don’t have juice, it’s that they don’t have the right kind of juice. “In Thailand, limes are beautiful and fragrant; they don’t have that puckery sourness of the Persian variety we get in the States,” Ricker says. Salt-Crusted Tilapia. Photo © Cedric Angeles. Ricker can go on like this until one questions why anyone would try making Thai food here at all. Cooking without the right ingredients is like playing Beethoven on the banjo: You can hit all the correct notes, but the music just isn’t the same. Ricker, however, found a solution. If he kept it simple, confining himself to basic ingredients available at Portland’s Asian markets, he could still serve authentic Thai food Americans hadn’t experienced before. “I don’t make dishes I can’t get the proper components for,” he says. “If a recipe calls for young tamarind leaves, I can’t make it.” But he can prepare an authentic Thai beef salad using fresh mint and roasted rice powder, and a Thai dessert of sticky rice, coconut milk and mangoes. To improve the quality of cilantro available locally, Ricker is working with some Oregon farmers to help them grow the herb the way it is cultivated in Thailand. “I’d like them to harvest plants younger, before the stems get massive and the leaves toughen. And I’d love if more people sold cilantro with the roots. Thai cooking uses all parts of the plant.” Thai limes, however, remain elusive, so Ricker often adds a little orange juice to Persian lime juice to soften the edge. Ricker burns through all this charcoal in his ever-expanding number of grills. He purchased his rotisserie in a Bangkok restaurant-supply store and modified it based on a design he encountered in Chiang Mai. He uses a barrel grill fashioned out of an oil drum to prepare dishes like his soy-marinated steak salad with mint. For delicate dishes like his salt-crusted tilapia, he turns to his fancy new Traeger grill, which burns wood pellets. Nick Fauchald, a former F&W staffer, is the editor of an epicurean e-mail called Tastingtable.com. He lives in New York City.